As a family owned and operated business established in 1959, Leon’s Electrical & Plumbing boasts a 3-generation commitment to providing a superior experience, and the highest quality customer service. We are full service electrical, HVAC and plumbing serving residential, commercial and industrial customers in Fayette, Colorado & Lavaca Counties. In 2017, we expanded to the Katy/West Houston area to provide service specifically for new commercial construction. Our business philosophy is simple and direct. We give to our customers, the best service, and the best products. 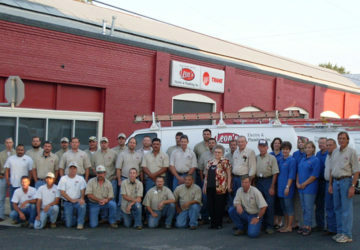 As a family-owned business, we treat our employees like family. That hometown, family feeling extends to when our workers come to your home or place of business.